Was there a Medieval Warm Period anywhere in addition to the area surrounding the North Atlantic Ocean, where its occurrence is uncontested? This question is of utmost importance to the ongoing global warming debate, since if there was, and if the locations where it occurred were as warm then as they are currently, there is no need to consider the temperature increase of the past century as anything other than the natural progression of the persistent millennial-scale oscillation of climate that regularly brings the earth several-hundred-year periods of modestly higher and lower temperatures that are totally independent of variations in atmospheric CO2 concentration. Hence, this question is here considered as it applies to South America, a region far removed from where the existence of the Medieval Warm Period was first recognized. In Argentina, Cioccale (1999) assembled what was known at the time about the climatic history of the central region of the country over the past 1400 years, highlighting a climatic "improvement" that began some 400 years before the start of the last millennium, which ultimately came to be characterized by "a marked increase of environmental suitability, under a relatively homogeneous climate." And as a result of this climatic amelioration that marked the transition of the region from the Dark Ages Cold Period to the Medieval Warm Period, Cioccale reported that "the population located in the lower valleys ascended to higher areas in the Andes," where they remained until around AD 1320, when the transition to the stressful and extreme climate of the Little Ice Age began. Down at the southern tip of the country in Tierra del Fuego, Mauquoy et al. (2004) inferred similar changes in temperature and/or precipitation from plant macrofossils, pollen, fungal spores, testate amebae and humification associated with peat monoliths collected from the Valle de Andorra. These new chronologies were compared with other chronologies of pertinent data from both the Southern and Northern Hemispheres in an analysis that indicated there was evidence for a period of warming-induced drier conditions from AD 960-1020, which, in their words, "seems to correspond to the Medieval Warm Period (MWP, as derived in the Northern Hemisphere)." They also noted that "this interval compares well to the date range of AD 950-1045 based on Northern Hemisphere extratropical tree-ring data (Esper et al., 2002)," and they thus concluded that this correspondence "shows that the MWP was possibly synchronous in both hemispheres, as suggested by Villalba (1994)." One year later, Haberzettl et al. (2005) worked with five sediment cores extracted from Laguna Potrok Aike (51°58'S, 70°23'W), which is one of the few permanently water-filled lakes in the dry-lands of southern Patagonia, where they analyzed a host of proxy climate indicators, finding that "the sediment record of Laguna Potrok Aike reveals an unprecedented sensitive continuous high resolution lake level, vegetation and climate record for southern Patagonia since AD 400." This history indicates that the climate of the region fluctuated rapidly from the beginning of the record right up to the start of the Medieval Climatic Anomaly (MCA, which was proposed by Stine (1998) to have begun at about AD 870). This earlier interval of time corresponds with the Dark Ages Cold Period of Europe; and it was followed, of course, by the MCA, or what Europeans called the Medieval Warm Period, which was most strongly expressed in the Laguna Potrok Aike data from AD 1240 to 1410, during which period maxima of total inorganic carbon (TIC), total organic carbon (TOC), total nitrogen (TN), carbon/nitrogen ratio (C/N) and δ13Corg indicated, in the words of the ten researchers, "low lake levels and warm and dry climate." Thereafter, as the scientists continued, "the MCA ends during the 15th century" and is "followed by the so called 'Little Ice Age'." Last of all, "in the course of the 20th century," they report that "Laguna Potrok Aike reacted like many other Patagonian lakes with a lake level lowering after 1940, culminating in 1990, and followed by a subsequent rise and recession." With respect to the question of whether it was warmer during the MCA than during the 20th century," Haberzettl et al. stated "there is evidence for lower lake levels during the MCA than today in every proxy," and that "the existence of lower lake levels in former times was demonstrated by seismic studies which revealed hitherto undated fossil lake level terraces ca. 30 m below the present lake level (Zolitschka et al., 2004)." In addition, they wrote that "TOC and TN as proxies reflecting productivity also show higher values during the MCA than today," even though "present TOC and TN values are elevated due to anthropogenic eutrophication." And so they concluded that "this altogether implies that it might have been warmer during [AD 1240 to 1410] than today." In Bolivia, Kellerhals et al. (2010) introduced their study of the climate of the Bolivian Andes by noting that "to place recent global warming into a longer-term perspective and to understand the mechanisms and causes of climate change, proxy-derived temperature estimates are needed for time periods prior to instrumental records and regions outside instrumental coverage." And in this regard they indicated that "for tropical regions and the Southern Hemisphere ... proxy information is very fragmentary." To help fill this data void, the team of six scientists developed what they described as "a reconstruction of tropical South American temperature anomalies over the last ~1600 years ... based on a highly resolved and carefully dated ammonium record from an ice core that was drilled in 1999 on Nevado Illimani [16°37'S, 67°46'W] in the eastern Bolivian Andes," while noting that "studies from other remote ice core sites have found significant correlations between NH4+ concentration and temperature for Siberia and the Indian subcontinent for preindustrial time periods," citing the work of Kang et al. (2002) and Eichler et al. (2009). As for calibrating and validating the NH4+-to-°C transfer function, they said they used "the Amazon Basin subset of the gridded HadCRUT3 temperature data set," which is described by Brohan et al. (2006). With respect to their findings, Kellerhals et al. said that "the most striking features in the reconstruction are  the warm temperatures from ~1050 to ~1300 AD [the Medieval Warm Period] compared to the preceding and following centuries,  the persistent cooler temperatures from ~1400 to ~1800 AD [the Little Ice Age], and  the subsequent rise to warmer temperatures [the Current Warm Period] which eventually seem to exceed, in the last decades of the 20th century, the range of past variation." And in regard to this last observation, the graph of their data suggests that the peak warmth of the Current Warm Period may, in this particular case, actually have been ~0.27°C greater than the peak warmth of the Medieval Warm Period. In Brazil, Vuille et al. (2012) reviewed the history of the South American summer monsoon (SASM) over the past two millennia, based on information obtained from high-resolution stable isotopes derived from speleothems, ice cores and lake sediments acquired from the monsoon belt of the tropical Andes and Southeast Brazil. This work revealed, as they describe it, "a very coherent behavior over the past two millennia with significant decadal to multi-decadal variability superimposed on large excursions during three key periods: the Medieval Climate Anomaly (MCA), the Little Ice Age (LIA) and the current warm period (CWP)," which they interpreted as "times when the SASM's mean state was significantly weakened (MCA and CWP) and strengthened (LIA), respectively." The nine researchers then hypothesized that "these centennial-scale climate anomalies were at least partially driven by temperature changes in the Northern Hemisphere and in particular over the North Atlantic, leading to a latitudinal displacement of the Intertropical Convergence Zone and a change in monsoon intensity (amount of rainfall upstream over the Amazon Basin)." And with their noting that the intensity of the SASM "today appears on par with conditions during the MCA," it can logically be concluded that the peak temperatures of the MCA and the CWP over the North Atlantic Ocean are likely on a par with each other as well, which suggests that (1) there is nothing unusual, unnatural or unprecedented about today's current level of warmth over the North Atlantic, and that (2) today's level of warmth everywhere need not have been caused by the 40% greater atmospheric CO2 concentration of today. In Chile, Jenny et al. (2002) studied geochemical, sedimentological and diatom-assemblage data derived from sediment cores extracted from one of the largest natural lakes (Laguna Aculeo) in the central part of the country. From 200 BC, when the record began, until AD 200, conditions there were primarily dry, during the latter stages of the Roman Warm Period. Subsequently, from AD 200-700, with a slight respite in the central hundred years of that period, there was a high frequency of flood events, during the Dark Ages Cold Period. Then came a several-hundred-year period of less flooding that was coeval with the Medieval Warm Period. This more benign period was then followed by another period of frequent flooding from 1300-1700 that was coincident with the Little Ice Age, after which flooding picked up again after 1850. Some five years later, Nester et al. (2007) studied fluvial terraces in the Pampa del Tamarugal (PdT) basin of the Atacama Desert of northern Chile, which contains widespread fossil wood, in situ roots, and well preserved leaf litter deposits indicative of perennial surface flow in now-dry channels, where streams once cut canyons in the desert's currently hyper-arid core. In this challenging environment, and based on radiocarbon dating, the five researchers determined the approximate dates of the most important recharge events of these channels of the last 18,000 years, demonstrating "there was enhanced stream discharge into the PdT during the time intervals of 17,750-13,750, 11,750, and 1,100-700 cal yr BP," while noting that "groundwater must have been near the surface (<10 m) for Prosopis stands to have lived [there] between 1,100-700 cal yr BP." And this latter Chilean "Medieval Climatic Anomaly (MCA)," as they described it, "is of opposite hydrological impact (wet) to that of coastal Peru (dry), where lithic concentrations in a marine core document diminished strength of El Niño events during the MCA (Rein et al., 2004)." This wettest interval of the past 11,000-plus years in the hyper-arid core of the Atacama Desert (~AD 900-1300) coincides nicely with the central portion of the mean timeframe of the MWP as experienced around the globe. And this unique set of regional circumstances - wet in the Atacama Desert of Chile and dry along coastal Peru - is a strong indication of the dramatic but varied hydrological effects of the global Medieval Warm Period in this particular part of the world. After one additional year had passed, Rebolledo et al. (2008) analyzed changes in marine productivity and contemporaneous terrestrial input in a study of sediment cores retrieved from the Jacaf Channel (44°S, 72°W) of Chilean Northern Patagonia that contained data pertaining to the past 1800 years, using biogenic opal, siliceous microorganisms, alkenones, and organic (Corg content, molar C/N) and inorganic (Cinorg, Fe, Ti, Ca) elements as proxies for terrestrial input and/or carbonate productivity, after which they compared their findings with those of other researchers who had conducted similar paleoclimatic studies in various parts of South America and Antarctica. In doing so, the seven scientists first found, and then reported, that "the down-core record clearly shows two productivity/climate modes." And as they described it, the first period - prior to 900 cal yr BP and including the Medieval Warm Period (MWP) - is characterized by "decreased marine productivity and a reduced continental signal, pointing to diminished precipitation and runoff," while they note that the second period - between 750 cal yr BP and the late 1800s, and including the Little Ice Age (LIA) - is characterized by "elevated productivity and an increased continental signal, suggesting higher precipitation and runoff." In addition, their data clearly showed that the MWP and LIA were "separated by a relatively abrupt transition of ~150 years." And in addition to providing another demonstration of the reality of the MWP and LIA in South America, the Chilean, German and U.S. scientists stated that the good correspondence between their record and various "other paleoclimate studies carried out in South America and Antarctica demonstrates that the Chilean fjord area of Northern Patagonia is not just sensitive to local climatic variability but also to regional and possibly global variability." Fast-forwarding another year, von Gunten et al. (2009) wrote that "quantitative high-resolution global, hemispherical and regional climate reconstructions covering the last millennium are fundamental in placing modern climate warming into a long-term context," in order to "assess the sensitivity of the climate system to natural and anthropogenic forcings, and thus to reduce uncertainty about the magnitude and impact of future global climate change." And they stated, in this regard, that for the entire Southern Hemisphere, "Mann and Jones (2003) considered only five data sets suitable for their work on surface temperature reconstructions for the past two millennia," noting that "only two of these data series are from South America," one of which is a tree-ring record "with unknown preservation of the low-frequency component of climate variability" and the other of which is a δ18O ice core record that they described as "arguably putative at best" in terms of its temperature signal. To help fill this vast data void, von Gunten et al. developed a continuous high-resolution (1-3 years sampling interval, 5-year filtered reconstruction) austral summer (December to February) temperature reconstruction based on chloro-pigments derived from algae and phototrophic bacteria found in sediment cores retrieved from Central Chile's Laguna Aculeo (33°50'S, 70°54'W) in 2005 that extended back in time to AD 850, which they described as "the first quantitative temperature reconstruction for Central Chile for the last millennium." And in accomplishing this feat, the Swiss, German and UK scientists reported that their data provided "quantitative evidence for the presence of a Medieval Climate Anomaly (in this case, warm summers between AD 1150 and 1350; ΔT = +0.27 to +0.37°C with respect to (wrt) twentieth century) and a very cool period synchronous to the 'Little Ice Age' starting with a sharp drop between AD 1350 and AD 1400 (-0.3°C/10 years, decadal trend) followed by constantly cool (ΔT = -0.70 to -0.90°C wrt twentieth century) summers until AD 1750." Looking at the graph of their data, the peak warmth of the Medieval Climate Anomaly appears to be about 0.7°C warmer than the last decade or so of the 20th century, but only about 0.25°C warmer than the peak warmth of the 20th century, which occurred in the late 1940s for both their reconstructed temperatures and their instrumental data, which are essentially identical over most of the 1900s. In addition, they stated that the "structure of variability" that is present in their data "is consistent in great detail with annually resolved tree-ring-based warm-season temperature and river discharge reconstructions from northern Patagonia for the past 400 years, with qualitative climate reconstructions from Andean glacier fluctuations, and with hydrological changes in Patagonian lake sediment records." The meticulous work of the five researchers thus clearly demonstrated the existence of both the Medieval Warm Period (MWP) and Little Ice Age in the Southern Hemisphere, as well as the fact that the MWP was warmer (and for a lot longer) than the Current Warm Period has been to date. Hence, there would appear to be nothing unusual, unnatural or unprecedented about the planet's current level of warmth - or the rate at which it was achieved - which further suggests that there is no need to invoke current higher concentrations of atmospheric CO2 as the cause of these nondescript features of our current climate. Concurrently, Sepulveda et al. (2009) wrote that "deciphering climate variability in the Southern Hemisphere and particularly from southern South America - the only continental land mass lying between 38°S and the Antarctic Circle - is crucial for documenting the inter-hemispheric synchronicity of recent abrupt climate changes and thereby determining their ultimate cause(s)," as well as for "predicting future abrupt climate changes." And, therefore, the eight researchers conducted "a high-resolution multi-proxy study including the elemental and isotopic composition of bulk organic matter, land plant-derived biomarkers, and alkenone-based sea-surface temperature (SST) [derived] from a marine sedimentary record obtained from the Jacaf Fjord in northern Chilean Patagonia [44°20.00'S, 72°58.15'W]," in order to provide "a detailed reconstruction of continental runoff, precipitation and summer SST spanning the last 1750 years." And what did they learn? The Chilean, German and US scientists reported that they "observed two different regimes of climate variability in [their] record: a relatively dry/warm period before 900 cal yr BP (higher runoff and average SST 1°C warmer than present day) and a wet/cold period after 750 cal yr BP (higher runoff and average SST 1°C colder than present day)," which they associated with the Medieval Warm Period and Little Ice Age, respectively. And in the words of the research team, "the reasonably good correlation between our results (particularly SST) and other continental and marine archives from central-south Chile, Peru, and Antarctica ... confirms the occurrence of globally important climatic anomalies such as the Medieval Warm Period and the Little Ice Age." Also, their SST data indicate that the current level of warmth in that part of the world still has a long way to go before equaling the warmth experienced there a thousand and more years ago, which suggests that the region's current level of warmth is neither unprecedented nor unnatural - and therefore need not be CO2-induced - as is also the case for most of the rest of the planet. Most recently, Fletcher and Moreno (2012), as they describe it, "sampled and analyzed sediment cores from Laguna San Pedro (38°26'S, 71°19'W)," which they describe as "a small closed-basin lake located within the present-day distribution of Araucaria-Nothofagus forest in the Temperate-Mediterranean Transition zone in the Andes of Chile," where they focused on reconstructing the vegetation, climate and fire regime histories of the past 1500 years. In doing so, they found evidence for what they describe as "persistent cool/La Nina ENSO states" during the periods 1300-1000 and 725-121 cal yr BP, which they identified as the "Dark Ages Cold Period and Little Ice Age, respectively." In addition, they report finding evidence of "low relative growing season moisture and warmer temperature that correspond well with evidence for persistent warm/El Nino ENSO states (1500-1300 and 1000-725 cal yr BP)," which they respectively associate with the Roman Warm Period and Medieval Climate Anomaly. And last of all, during the transition from the Little Ice Age to the Current Warm Period, which occurred from 121 cal yr BP (AD 1829) to the present, they found evidence for "a dramatic landscape alteration associated with the arrival of exotic taxa and an increase in burning," which they attributed to European colonization of the area. Fletcher and Moreno also state that "the palaeo-environmental history inferred from Laguna San Pedro provides important palaeo-climatic information for this part of southern South America that is poorly represented in the palaeo-climate literature." And that information buttresses the ever-increasing likelihood that the natural climatic oscillation that has alternately brought the entire globe the Roman Warm Period, the Dark Ages Cold Period, the Medieval Warm Period and the Little Ice Age is also what has ushered the earth into the Current Warm Period, which realization leads to the logical conclusion that the historical increase in the air's CO2 content that has accompanied the rise and progress of the Industrial Revolution has likely had nothing to do with earth's current level of not-so-unusual-warmth. In Paraguay, Polissar et al. (2006) derived continuous decadal-scale records of two climate-relevant parameters related to precipitation/evaporation balance - and, hence, glacier activity - from sediment cores extracted from Laguna Blanca (8°20'N, 71°47'W) and Laguna Mucubaji (8°47'N, 70°50'W), while data they obtained from the nearby Piedras Blancas peat bog yielded a third such parameter - "pollen histories that chronicle vegetation change in response to climate" - all three of which parameters suggested that the MWP was warmer than the CWP. In the case of Laguna Blanca magnetic susceptibility, the MWP's greater warmth extended from before the start of the record (sometime prior to AD 500) to approximately AD 1300. In the case of the abundance of sedge pollen from the Piedras Blancas peat bog, it extended from about AD 550 to 1020; and in the case of altitudinal shifts in ecological zones derived from the Piedras Blancas data, it extended from sometime before the start of the record to about AD 1000. And, therefore, for the period of time over which all three data sets indicate the MWP was warmer than the CWP, i.e., AD 550-1000, one can be fairly confident that such was truly the case. Another important aspect of the Polissar et al. study was that it clearly implicated solar variability as the cause of the climatic variations they observed. The six scientists noted, for example, that "four glacial advances occurred between AD 1250 and 1810, coincident with solar-activity minima," and they noted that the data they presented "suggest that solar activity has exerted a strong influence on century-scale tropical climate variability during the late Holocene, modulating both precipitation and temperature," as well as demonstrating the "considerable sensitivity of tropical climate to small changes in radiative forcing from solar irradiance variability." In Peru, Chepstow-Lusty et al. (1998) derived a 4000-year climate history from a study of pollen in sediment cores obtained from a recently in-filled lake in the Patacancha Valley near Marcacocha. Their data indicated a several-century decline in pollen content after AD 100, as the Roman Warm Period gave way to the long and dreary Dark Ages Cold Period. However, a "more optimum climate," as they described it, with warmer temperatures and drier conditions, came into being and prevailed for several centuries after about AD 900, which was, of course, the Medieval Warm Period, which was followed by the Little Ice Age, all of which climatic periods are in nearly perfect temporal agreement with the climatic history derived by McDermott et al. (2001) from a study of a stalagmite recovered from a cave nearly half the world away in Ireland. Subsequent work in this area was conducted by Chepstow-Lusty and Winfield (2000) and Chepstow-Lusty et al. (2003). Centered on approximately 1000 years ago, the former researchers identified what they described as "the warm global climatic interval frequently referred to as the Medieval Warm Epoch." This extremely arid interval in this part of South America, in their opinion, may have played a significant role in the collapse of the Tiwanaku civilization further south, where a contemporaneous prolonged drought occurred in and around the area of Lake Titicaca (Binford et al., 1997; Abbott et al., 1997). Near the start of this extended dry period, which had gradually established itself between about AD 700 and 1000, Chepstow-Lusty and Winfield report that "temperatures were beginning to increase after a sustained cold period that had precluded agricultural activity at these altitudes." This earlier colder and wetter interval was coeval with the Dark Ages Cold Period of the North Atlantic region, which in the Peruvian Andes had held sway for a good portion of the millennium preceding AD 1000, as revealed by a series of climatic records developed from sediment cores extracted from yet other lakes in the Central Peruvian Andes (Hansen et al., 1994) and by proxy evidence of concomitant Peruvian glacial expansion (Wright, 1984; Seltzer and Hastorf, 1990). Preceding the Dark Ages Cold Period in both parts of the world was what in the North Atlantic region is called the Roman Warm Period. This well-defined climatic epoch is also strikingly evident in the pollen records of Chepstow-Lusty et al. (2003), straddling the BC/AD calendar break with one to two hundred years of relative warmth and significant aridity on both sides of it. Returning to the Medieval Warm Period and preceding towards the present, the data of Chepstow-Lusty et al. (2003) revealed the occurrence of the Little Ice Age, which in the Central Peruvian Andes was characterized by relative coolness and wetness. These characteristics of that climatic interval are also evident in ice cores retrieved from the Quelccaya ice cap in southern Peru, the summit of which extends 5670 meters above mean sea level (Thompson et al., 1986, 1988). Finally, both the Quelccaya ice core data and the Marcacocha pollen data revealed the transition to the drier Current Warm Period that occurred over the past 100-plus years. In harmony with these several findings are the related observations of Rein et al. (2004), who derived a high-resolution flood record of the entire Holocene from an analysis of the sediments in a 20-meter core retrieved from a sheltered basin situated on the edge of the Peruvian shelf about 80 km west of Lima. These investigators found a major Holocene anomaly in the flux of lithic components from the continent onto the Peruvian shelf during the Medieval period. Specifically, they reported that "lithic concentrations were very low for about 450 years during the Medieval climatic anomaly from A.D. 800 to 1250." In fact, they state that "all known terrestrial deposits of El Niño mega-floods (Magillian and Goldstein, 2001; Wells, 1990) precede or follow the medieval anomaly in our marine records and none of the El Niño mega-floods known from the continent date within the marine anomaly." In addition, they report that "this precipitation anomaly also occurred in other high-resolution records throughout the ENSO domain," citing eleven other references in support of this statement. Consequently, because heavy winter rainfalls along and off coastal Peru only occur during times of maximum El Niño strength, and because El Niños are typically more prevalent and stronger during cooler as opposed to warmer periods, the lack of strong El Niños from A.D. 800 to 1250 suggests that this period was truly a Medieval Warm Period; and the significance of this observation was not lost on Rein et al. In the introduction to their paper, for example, they noted that "discrepancies exist between the Mann curve and alternative time series for the Medieval period." Most notably, to use their words, "the global Mann curve has no temperature optimum, whereas the Esper et al. (2002) reconstruction shows northern hemisphere temperatures almost as high as those of the 20th century" during the Medieval period. And as a result, in the final sentence of their paper they suggest that "the occurrence of a Medieval climatic anomaly (A.D. 800-1250) with persistently weak El Niños may therefore assist the interpretation of some of the regional discrepancies in thermal reconstructions of Medieval times," which is a polite way of suggesting that the Mann et al. (1998, 1999) hockeystick temperature history is deficient in not depicting the presence of a true Medieval Warm Period. Several years later, while working with an annually-resolved authigenic calcite record of precipitation δ18O obtained from a varved lake in the Central Peruvian Andes - Laguna Pumacocha (10.70°S, 76.06°W, 4300 m asl) - Bird et al. (2011) developed a 2300-year history of the South American Summer Monsoon (SASM) that shows, in their words, that "δ18O peaked during the Medieval Climate Anomaly (MCA) from AD 900 to 1100, providing evidence that the SASM weakened considerably during this period." Thereafter, they found that "minimum δ18O values occurred during the Little Ice Age (LIA) between AD 1400 and 1820, reflecting a prolonged intensification of the SASM," after which they found that "δ18O increased rapidly, particularly during the Current Warm Period (CWP; AD 1900 to present), indicating a return to reduced SASM precipitation." The six scientists also noted that the Pumacocha record tracks the 900-year-long Cascayunga Cave δ18O record (6.09°S, 77.23°W, 930 m asl), which they said "is interpreted as a record of South American rainfall (Reuter et al., 2009)," and they reported that it shares many features with the annually-resolved Quelccaya Ice Cap δ18O record (13.93°S, 70.83°W, 5670 m asl), which was derived by Thompson et al. (1986). And they thus decided that "the close agreement in the timing, direction, and magnitude of mean state changes in δ18O during the MCA, LIA, and CWP from lake sediment, speleothem, and ice core records supports the idea that a common large-scale mechanism influenced δ18O reaching these central Andean sites spanning 11° latitude and 4,740 meters of elevation," concluding that based on the above observations, "the most likely cause of these documented shifts in δ18Oprecip is a change in SASM intensity, as all three sites receive the majority of their annual precipitation during the monsoon season." Most interesting of all, however, was what Bird et al. described as the "remarkable correspondence" that exists between the Pumacocha δ18O record of SASM rainfall and the 2000-year Northern Hemispheric temperature reconstruction of Moberg et al. (2005), plus the similar relationship that both records share with the somewhat shorter North Atlantic temperature reconstruction of Mann et al. (2009). 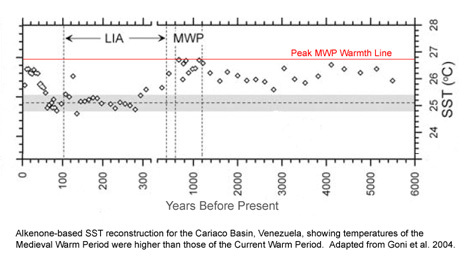 More specifically, they indicated that "the two greatest reductions in SASM intensity in the Pumacocha δ18O record were coincident with Northern Hemisphere temperature maxima during the MCA and CWP," and that "the SASM was stronger than at any other point in the last 2,300 years when Northern Hemisphere temperatures were at a 2,000-year low during the LIA." 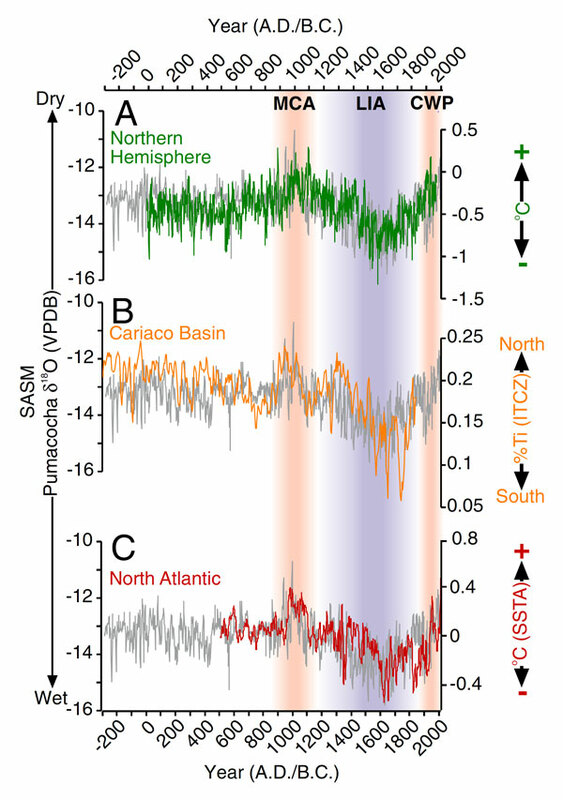 And as noted above, their data show that the same relationships exist between the Pumacocha δ18O history and the North Atlantic temperature history. What is especially interesting about these several observations is the fact that Bird et al. 's graphical representations of the Northern Hemisphere and North Atlantic temperature histories of Moberg et al. and Mann et al. both show the peak warmth of the MCA to be at least as great as, and possibly even a bit greater than, the peak warmth of the CWP, plus the fact that the δ18O data of Bird et al. suggest much the same thing, based upon what they call the "remarkable correspondence" among the three data sets, which can readily be seen in the figure below. (A) The reconstructed Northern Hemispheric temperature history of Moberg et al. (2005), (B) the reconstructed North Atlantic temperature history of Mann et al. (2009), and (C) the Cariaco Basin %Ti data of Haug et al. (2001) that represent the degree of northward migration of the Intertropical Convergence Zone, each plotted together with the δ18O data (grey lines) of Bird et al. (2011), from whose paper this figure is adapted. As can be seen in the figure above, the correspondence among the four data sets is nothing short of astounding; and, therefore, the equivalent or slightly greater warmth of the MCA (known also as the Medieval Warm Period or MWP) compared to that of the CWP would appear to be well established for the North Atlantic Ocean, the Northern Hemisphere, and a good portion of South America, in light of the fact that Bird et al. note that the diminished SASM precipitation (higher δ18O data) during the MWP and CWP also tracks the northward migration of the Intertropical Convergence Zone over the Atlantic, since "the Pumacocha record shows that the SASM was considerably reduced during the MCA when peak %Ti in the Cariaco Basin record indicates that the Intertropical Convergence Zone was persistently northward," as demonstrated by Haug et al. (2001). When all is said and done, therefore, it would appear that ever more evidence is pointing to the likelihood that the Medieval Warm Period of a thousand or so years ago was equally as warm as, or maybe even a little warmer than, the Current Warm Period has been to date. And since the air's CO2 concentration has risen by some 40% since the days of the MWP, and since it is no warmer now than it was back then, there is no compelling reason to believe that any of earth's current warmth is being provided by that huge increase in the atmosphere's CO2 content. In Uruguay, Bracco et al. (2011), as a backdrop for studying the emergence and development of prehistoric mound building, employed paleoclimatic data to obtain a picture of how the climate of the region changed over the course of the past 7000 years. Focusing on the coastal lagoons within the Merin Lagoon basin, which is located between 31-34°S and 52-54°W in the easternmost part of the South American plains, they reported how various paleo-limnological investigations were initiated there in AD 2000 by a multidisciplinary group of researchers who studied past climate conditions via "multiproxy analyses (i.e., diatoms, opal phytoliths, pollen, molluscs, sediments, geochemistry, thin sections), together with radiocarbon dating." And working predominantly with phytoliths that they found within various sediment cores, they derived 7000-year histories of both a temperature and a humidity index. This work revealed that straddling the division of the last two millennia was a period (AD 750-1350) that "was characterized by warmer and wetter conditions than those of the present," which matches well with the timeframe of the Medieval Warm Period on other continents. And within this period they said "there are two peaks of extreme humid and warm events," the second of which, in their words, "fits chronologically into the 'Warm Period' (Broecker, 2001; Roberts, 2009), whose occurrence has been already pointed out by Iriondo and Garcia (1993) and Prevosti et al. (2004) in this region." These findings help to establish the global nature of the Medieval Warm Period that climate alarmists are so loath to acknowledge. And to provide even more support for this view of the world, Bracco et al. write that the results they present "are consistent with other paleoclimatic reconstructions (Bracco et al., 2005; Garcia-Rodriguez et al., 2009) and the synthesis presented by Mancini et al. (2005), and they are partially consistent with other regional studies (Iriondo and Garcia, 1993; Prieto, 1996, 2000; Iriondo, 1999; Panario and Gutierrez, 1999; Tonni et al., 1999; Zarate et al., 2000; Prieto et al., 2004; Quattrocchio et al., 2008; Piovano et al., 2009, in Argentina; Behling, 1995, 2002, 2007; Melo et al., 2003; Moro et al., 2004, in Brazil." And this ever-expanding body of empirical findings continues to add ever more weight to the reality of the millennial-scale cycling of our planet's climate, which after the passing of the Little Ice Age that followed the Medieval Warm Period is likely what has most recently ushered us into the Current Warm Period. In Venezuala, Haug et al. (2001) found a temperature/precipitation relationship that was different from that of the rest of the continent. In examining the titanium and iron concentrations of an ocean sediment core taken from the Cariaco Basin on the country's northern shelf, they determined that the concentrations of these elements were lower during the Younger Dryas cold period between 12.6 and 11.5 thousand years ago, corresponding to a weakened hydrologic cycle with less precipitation and runoff, while during the warmth of the Holocene Optimum of 10.5 to 5.4 thousand years ago, titanium and iron concentrations remained at or near their highest values, suggesting wet conditions and an enhanced hydrologic cycle. Closer to the present, higher precipitation was also noted during the Medieval Warm Period from 1.05 to 0.7 thousand years ago, followed by drier conditions associated with the Little Ice Age between 550 and 200 years ago. In an update of this study, Haug et al. (2003) developed a hydrologic history of pertinent portions of the record that yielded "roughly bi-monthly resolution and clear resolution of the annual signal." This record revealed that "before about 150 A.D.," which according to the climate history of McDermott et al. corresponds to the latter portion of the Roman Warm Period (RWP), Mayan civilization had flourished. However, during the transition to the Dark Ages Cold Period (DACP), which was accompanied by a slow but long decline in precipitation, Haug et al. report that "the first documented historical crisis hit the lowlands, which led to the 'Pre-Classic abandonment' (Webster, 2002) of major cities." This crisis occurred during the first intense multi-year drought of the RWP-to-DACP transition, which was centered on about the year 250 A.D. Although the drought was devastating to the Maya, Haug et al. report that when it was over, "populations recovered, cities were reoccupied, and Maya culture blossomed in the following centuries during the so-called Classic period." Ultimately, however, there came a time of total reckoning, between about 750 and 950 A.D., during what Haug et al. determined was the driest interval of the entire Dark Ages Cold Period, when they report that "the Maya experienced a demographic disaster as profound as any other in human history," in response to a number of other intense multi-year droughts. During this Terminal Classic Collapse, as it is called, Haug et al. say that "many of the densely populated urban centers were abandoned permanently, and Classic Maya civilization came to an end." In assessing the significance of these several observations near the end of their paper, Haug et al. concluded that the latter droughts "were the most severe to affect this region in the first millennium A.D." Although some of these spectacular droughts were "brief," lasting "only" between three and nine years, Haug et al. reported that "they occurred during an extended period of reduced overall precipitation that may have already pushed the Maya system to the verge of collapse," which suggests that these droughts within dry periods were likely the proverbial straws that broke the camel's back. Although the Mayan civilization thus faded away, Haug et al. 's data soon thereafter depicted the development of the Medieval Warm Period, when the Vikings established their historic settlement on Greenland. Then came the Little Ice Age, which just as quickly led to the Vikings demise in that part of the world. This distinctive cold interval of the planet's millennial-scale climatic oscillation must have also led to hard times for the people of Mesoamerica and northern tropical South America; for according to the data of Haug et al., the Little Ice Age produced by far the lowest precipitation regime (of several hundred years duration) of the last two millennia in that part of the world. Three years after Haug et al. 's study, and based on the degree of unsaturation of certain long-chain alkenones synthesized by haptophyte algae contained in a sediment core retrieved from the eastern sub-basin of the Cariaco Basin (20°30'N, 64°40'W) on the continental shelf off the central coast of Venezuela, Goni et al. (2004) reconstructed a history of sea surface temperatures for that location covering the past 6000 years, as shown in the figure below. As can be seen here, the highest alkenone-derived sea surface temperatures "were measured during the Medieval Warm Period (MWP)," which Goni et al. identified as occurring between AD 800 and 1400. And it is further evident that peak MWP temperatures were approximately 0.35°C warmer than peak Current Warm Period (CWP) temperatures, and that they were fully 0.95°C warmer than the mean temperature of the last decade of the 20th century. In Southern South America (SSA), which was described by Neukom et al. (2011) as the terrestrial area of the planet located between 20°S and 55°S and between 30°W and 80°W, an international team of 18 researchers hailing from Argentina, Chile, Germany, Switzerland, The Netherlands, the United Kingdom and the United States suggested that in order to know how unusual, unprecedented or unnatural the global warming of the 20th century may have been, it is necessary "to put the recent warming into a larger temporal and spatial context." Therefore, working with 22 of the best climate proxies they could find that stretched far enough back in time, they reconstructed a mean austral summer (December-February) temperature history for the period AD 900-1995 for this region, noting that their results "represent the first seasonal sub-continental-scale climate field reconstruction of the Southern Hemisphere going so far back in time." In describing their findings, Neukom et al. wrote that their summer temperature reconstruction suggests that "a warm period extended in SSA from 900 (or even earlier) to the mid-fourteenth century," which they described as being temporally located "towards the end of the Medieval Climate Anomaly as concluded from Northern Hemisphere temperature reconstructions." And as can be seen from the figure below, the warmest decade of this Medieval Warm Period was calculated by them to be AD 1079-1088, which would appear from their graph to be about 0.17°C warmer than the peak warmth of the Current Warm Period. Reconstructed mean summer SSA temperatures. Adapted from Neukom et al. (2011). This finding of Neukom et al. goes a long ways towards demonstrating that: (1) the Medieval Warm Period was a global phenomenon that was comprised of even warmer intervals than the warmest portion of the Current Warm Period, and that (2) the greater warmth of the Medieval Warm Period occurred when there was far less CO2 in the air than there is nowadays, which facts clearly demonstrate that the planet's current - but not unprecedented - degree of warmth need not have been CO2-induced. In conclusion, it is difficult to believe that the strong synchronicity of the century-long Northern Hemispheric and South American warm and cold periods described above was coincidental. It is much more realistic and reasonable to believe that it was the result of a millennial-scale oscillation of climate that is global in scope and driven by some regularly-varying forcing factor. Although one can argue about the identity of that forcing factor and the means by which it exerts its influence, one thing should be clear: it is not the atmosphere's CO2 concentration, which has only exhibited a significant in-phase variation with global temperature change over the Little Ice Age-to-Current Warm Period transition. This being the case, it should be clear that the climatic amelioration of the past century or more has had nothing to do with the concomitant rise in the air's CO2 content but everything to do with the influential - and possibly solar-animated - forcing factor that has governed the millennial-scale oscillation of the earth's climate as far back in time as scientists have been able to detect it. Abbott, M.B., Binford, M.W., Brenner, M. and Kelts, K.R. 1997. A 3500 14C yr high resolution record of water-level changes in Lake Titicaca. Quaternary Research 47: 169-180. Behling, H. 1995. Late Quaternary environmental history from 5 new sites in the Brazilian tropics. Abstracts, 14th INQUA Congress, Berlin, Germany, p. 25. Behling, H. 2002. South and Southeast Brazilian grasslands during Late Quaternary times: a synthesis. Paleogeography, Palaeoclimatology, Palaeoecology 177: 19-27. Behling, H. 2007. Late Quaternary vegetation, fire and climate dynamics of Serra do Aracatuba in the Atlantic coastal mountains of Parana State, southern Brazil. Vegetation, History and Archaeobotany 16: 77-85. Binford, M.W., Kolata, A.L, Brenner, M., Janusek, J.W., Seddon, M.T., Abbott, M. and Curtis. J.H. 1997. Climate variation and the rise and fall of an Andean civilization. Quaternary Research 47: 235-248. Bird, B.W., Abbott, M.B., Vuille, M., Rodbell, D.T., Stansell, N.D. and Rosenmeier, M.F. 2011. A 2,300-year-long annually resolved record of the South American summer monsoon from the Peruvian Andes. Proceedings of the National Academy of Sciences USA 108: 8583-8588. Bracco, R., del Puerto, L., Inda, H. and Castineira, C. 2005. Middle-late Holocene cultural and environmental dynamics in the east of Uruguay. Quaternary International 132: 37-45. Bracco, R., del Puerto, L., Inda, H., Panario, D., Castineira, C. and Garcia-Rodriguez, F. 2011. The relationship between emergence of mound builders in SE Uruguay and climate change inferred from opal phytolith records. Quaternary International 245: 62-73. Broecker, W. 2001. Was the Medieval Warm Period global? Science 291: 1497-1499. Chepstow-Lusty, A., Frogley, M.R., Bauer, B.S., Bush, M.B. and Herrera, A.T. 2003. A late Holocene record of arid events from the Cuzco region, Peru. Journal of Quaternary Science 18: 491-502. Chepstow-Lusty, A. and Winfield, M. 2000. Inca agroforestry: Lessons from the past. Ambio 29: 322-328. Cioccale, M.A. 1999. Climatic fluctuations in the Central Region of Argentina in the last 1000 years. Quaternary International 62: 35-47. Eichler, A., Brutsch, S., Olivier, S., Papina, T. and Schwikowski, M. 2009. A 750-year ice core record of past biogenic emissions from Siberian boreal forests. Geophysical Research Letters 36: 10.1029/2009GL038807. Fletcher, M.-S. and Moreno, P.I. 2012. Vegetation, climate and fire regime changes in the Andean region of southern Chile (38°S) covaried with centennial-scale climate anomalies in the tropical Pacific over the last 1500 years. Quaternary Science Reviews 46: 46-56. Garcia-Rodriguez, F., Piovano, E., del Puerto, L., Inda, H., Stutz, S., Bracco, R., Panario, D., Cordoba, F., Sylvestre, F. and Ariztegui, D. 2009. South American lake paleo-records across the Pampean Region. PAGES News 17: 115-117. Goni, M.A., Woodworth, M.P., Aceves, H.L., Thunell, R.C., Tappa, E., Black, D., Muller-Karger, F., Astor, Y. and Varela, R. 2004. Generation, transport, and preservation of the alkenone-based U37K' sea surface temperature index in the water column and sediments of the Cariaco Basin (Venezuela). Global Biogeochemical Cycles 18: 10.1029/2003GB002132. Haberzettl, T., Fey, M., Lucke, A., Maidana, N., Mayr, C., Ohlendorf, C. Schabitz, F., Schleser, G.H., Wille, M. and Zolitschka, B. 2005. Climatically induced lake level changes during the last two millennia as reflected in sediments of Laguna Potrok Aike, southern Patagonia (Santa Cruz, Argentina). Journal of Paleolimnology 33: 283-302. Hansen, B.C.S., Seltzer, G.O. and Wright Jr., H.E. 1994. Late Quaternary vegetational change in the central Peruvian Andes. Palaeogeography, Palaeoclimatology, Palaeoecology 109: 263-285. Haug, G.H., Gunther, D., Peterson, L.C., Sigman, D.M., Hughen, K.A. and Aeschlimann, B. 2003. Climate and the collapse of Maya civilization. Science 299: 1731-1735. Haug, G.H., Hughen, K.A., Sigman, D.M., Peterson, L.C. and Rohl, U. 2001. Southward migration of the intertropical convergence zone through the Holocene. Science 293: 1304-1308. Iriondo, M. 1999. Climate changes in the South American plains: record of a continent-scale oscillation. Quaternary International 57/58: 93-112. Iriondo, M. and Garcia, N. 1993. Climate variation in the Argentine plains during the last 18,000 years. Palaeogeography, Palaeoclimatology, Palaeoecology 101: 209-220. Jenny, B., Valero-Garces, B.L., Urrutia, R., Kelts, K., Veit, H., Appleby, P.G. and Geyh M. 2002. Moisture changes and fluctuations of the Westerlies in Mediterranean Central Chile during the last 2000 years: The Laguna Aculeo record (33°50'S). Quaternary International 87: 3-18. Kang, S.C., Mayewski, P.A., Qin, D., Yan, Y., Zhang, D., Hou, S. and Ren, J. 2002. Twentieth century increase of atmospheric ammonia recorded in Mount Everest ice core. Journal of Geophysical Research 107: 10.1029/2001JD001413. Mancini, M., Paez, M.M., Prieto, A.R., Stutz, S., Tonello, M. and Vilanova, I. 2005. Mid-Holocene climate variability reconstruction from pollen records (32°-52°S, Argentina). Quaternary International 132: 47-59. Mann, M.E. and Jones, P.D. 2003. Global surface temperatures over the past two millennia. Geophysical Research Letters 30: 1-4. Mauquoy, D., Blaauw, M., van, Geel, B., Borromei, A., Quattrocchio, M., Chambers, F.M. and Possnert, G. 2004. Late Holocene climatic changes in Tierra del Fuego based on multiproxy analyses of peat deposits. Quaternary Research 61: 148-158. Melo, M.S., Giannini, P.C.F., Pessenda, L.C. and Brandt Neto, M. 2003. Holocene paleoclimatic reconstruction based on the Lagoa Dourada deposits, southern Brazil. Geologica Acta 1: 289-302. Moro, R., Bicudo, C., de Melo, M. and Schmitt, J. 2004. Paleoclimate of the late Pleistocene and Holocene at Lagoa Dourada, Parana State, southern Brazil. Quaternary International 114: 87-99. Nester, P.L., Gayo, E., Latorre, C., Jordan, T.E. and Blanco, N. 2007. Perennial stream discharge in the hyper-arid Atacama Desert of northern Chile during the latest Pleistocene. Proceedings of the National Academy of Sciences, USA 104: 19,724-19,729. Panario, D. and Gutierrez, O. 1999. The continental Uruguayan Cenozoic: and overview. Quaternary International 62: 75-84. Piovano, E.L., Ariztegui, D., Cordoba, F., Coccale, M. and Sylvestre, F. 2009. Hydrological variability in South America below the Tropico of Capricorno (Pampas and Patagonia, Argentina) during the last 13.0 ka. In: Vimeux, F., Sylvestre, F. and Khodri, M. (Eds.). Past Climate Variability from the Last Glacial Maximum to the Holocene in South America and Surrounding Regions. Developments in Paleoenvironmental Research Series (DPER), Springer, New York, New York, USA, pp. 323-351. Prevosti, F.J., Bonomo, M. and Tonni, E.P. 2004. La distribucion de Chrysocyon brachyurus (Illiger, 1811) (mammalia: carnivore: canidae) durante el Holoceno en la Argentina; Implicancias paleoambientales. Mastozoologia neotropical 11: 27-43. Prieto, A.R. 1996. Late Quaternary vegetational and climate change in the Pampa Grassland of Argentina. Quaternary Research 54: 73-88. Prieto, A.R. 2000. Vegetational history of the Late Glacial-Holocene transition in the grasslands of Eastern Argentina. Palaeogeography, Palaeoclimatology, Palaeoecology 157: 167-188. Prieto, A.R., Blasi, A., De Francesco, C. and Fernandez, C. 2004. Environmental history since 11,000 14C yr B.P. of the northeastern Pampas, Argentina, from alluvial sequences of the Lujan River. Quaternary Research 62: 146-161. Quattrocchio, M.E., Borromei, A.M., Deschamps, C.M., Grill, S.C. and Zavala, C.A. 2008. Landscape evolution and climate changes in the Late Pleistocene-Holocene, southern Pampa (Argentina): evidence from palynology, mammals and sedimentology. Quaternary International 181: 123-138. Rebolledo, L., Sepulveda, J., Lange, C.B., Pantoja, S., Bertrand, S., Hughen, K. and Figueroa, D. 2008. Late Holocene marine productivity changes in Northern Patagonia-Chile inferred from a multi-proxy analysis of Jacaf channel sediments. Estuarine, Coastal and Shelf Science 80: 314-322. Reuter, J., Stott, L., Khidir, D., Sinha, A., Cheng, H. and Edwards, R.L. 2009. A new perspective on the hydroclimate variability in northern South America during the Little Ice Age. Geophysical Research Letters 36: 10.1029/2009GL041051. Roberts, N. 2009. Holocene climates. In: Gornitz, V. (Ed.). Encyclopedia of Paleoclimatology and Ancient Environments. Springer, New York, New York, USA, pp. 438-441. Seltzer, G. and Hastorf, C. 1990. Climatic change and its effect on Prehispanic agriculture in the central Peruvian Andes. Journal of Field Archaeology 17: 397-414. Sepulveda, J., Pantoja, S., Hughen, K.A., Bertrand, S., Figueroa, D., Leon, T., Drenzek, N.J. and Lange, C. 2009. Late Holocene sea-surface temperature and precipitation variability in northern Patagonia, Chile (Jacaf Fjord, 44°S). Quaternary Research 72: 400-409. Stine, S. 1998. Medieval Climatic Anomaly in the Americas. In: Issar, A.S. and Brown, N. (Eds. ), Water, Environment and Society in Times of Climatic Change. Kluwer Academic Publishers, Dordrecht, The Netherlands, pp. 43-67. Thompson, L.G., Davis, M.E., Mosley-Thompson, E. and Liu, K.-B. 1988. Pre-Incan agricultural activity recorded in dust layers in two tropical ice cores. Nature 307: 763-765. Thompson, L.G., Mosley-Thompson, E., Dansgaard, W. and Grootes, P.M. 1986. The Little Ice Age as recorded in the stratigraphy of the tropical Quelccaya ice cap. Science 234: 361-364. Tonni, E.P., Cione, A.L. and Figini, A.J. 1999. Predominance of arid climates indicated by mammals in the pampas of Argentina during the Late Pleistocene and Holocene. Palaeogeography, Palaeoclimatology, Palaeoecology 147: 257-281. Villalba, R. 1994. Tree-ring and glacial evidence for the Medieval Warm Epoch and the 'Little Ice Age' in southern South America. Climatic Change 26: 183-197.
von Gunten, L., Grosjean, M., Rein, B., Urrutia, R. and Appleby, P. 2009. A quantitative high-resolution summer temperature reconstruction based on sedimentary pigments from Laguna Aculeo, central Chile, back to AD 850. The Holocene 19: 873-881. Vuille, M., Burns, S.J., Taylor, B.L., Cruz, F.W., Bird, B.W., Abbott, M.B., Kanner, L.C., Cheng, H. and Novello, V.F. 2012. A review of the South American monsoon history as recorded in stable isotopic proxies over the past two millennia. Climate of the Past 8: 1309-1321. Webster, D. 2002. The Fall of the Ancient Maya. Thames and Hudson, London, UK. Wright Jr., H.E. 1984. Late glacial and Late Holocene moraines in the Cerros Cuchpanga, central Peru. Quaternary Research 21: 275-285. Zarate, M., Kemp, R.A., Espinosa, M. and Ferrero, L. 2000. Pedosedimentary and palaeoenvironmental significance of a Holocene alluvial sequence in the southern Pampas, Argentina. The Holocene 10: 481-488. Zolitschka, B., Schabitz, F., Lucke, A., Wille, M., Mayr, C., Ohlendorf, C., Anselmetti, F., Ariztegui, D., Corbella, H., Ercolano, B., Fey, M., Haberzettl, T., Maidana, N., Oliva, G., Paez, M. and Schleser, G.H. 2004. Climate changes in Southern Patagonia (Santa Cruz, Argentina) inferred from lake sediments - the multi-proxy approach of SALSA. PAGES News 12(2): 9-11.